African safari Kenya: Kenya is the home of the safari tradition and offers more than fifty National Parks and Reserve where visitors can appreciate the country’s diverse wildlife, breathtaking landscapes and colorful tribal culture. Kenya also offers more than 1,070 species of birds, a large proportion of the global total of 8,554 species. It’s Africa’s greatest wildlife sanctuary and offers excellent year-round game viewing. A safari to the Masai Mara enables you to witness the annual great wildebeest migration, which is the seventh natural wonder of the world between July and October. 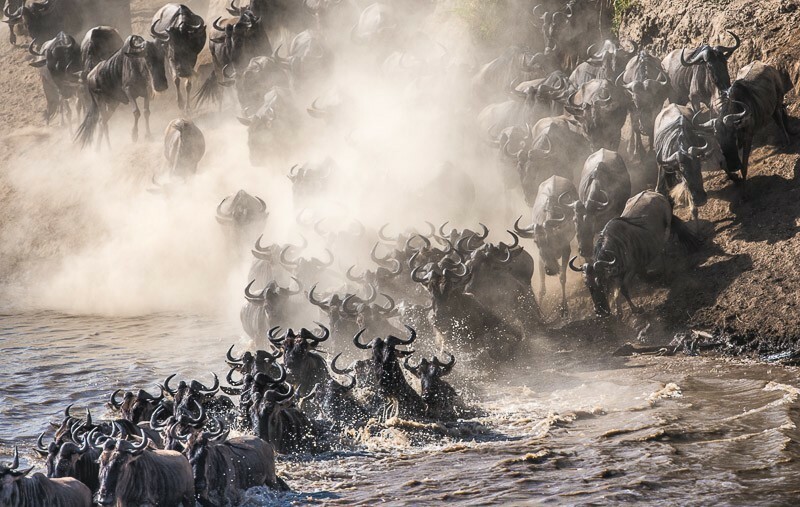 During the migration over a million wildebeests and zebras trek from the Serengati plains in Tanzania right through the reserve and back again in search of water and pasture. Lake Naivasha is a fresh water lake on the Great Rift Valley that’s home to more than 400 species of birds. Surrounding the lakes, wildlife includes African buffaloes, leopards, lions, rhinos and other Kenya wild animals. Mount Kenya is Africa’s second highest mountain after Mount Kilimanjaro. It offers easy or challenging ascents with spectacular scenery. The mountain’s highest peaks are Batian (5,199 m), Nelion (5,188 m) and Point Lenana (4,985 m). Samburu National Reserve is a game watcher’s and bird watcher’s paradise and has a pleasant aura of vastness and seclusion. All the Big Five can be seen here and the grevy’s zebra, Somali ostrich, kudu, reticulated giraffe and long necked gerenuk are unique to the park. Tsavo National Park is one of the largest wildlife park in the world and the largest in Kenya. The park is divided into Tsavo East and Tsavo West. Both parks have an abundance of wild animals, bird life and geophysical attractions. An African safari in the park can easily be combined with a Kenya beach holiday, as the park is only 100 km from Mombasa. There are tailor-made tour packages that enable you to visit these and other safari destinations in Kenya. The tours can be customized to meet individual requirements.